A few weeks ago, an email exchange with the esteemed Murilee Martin (aka Judge Phil of the 24 Hours of LeMons Supreme Court) presented us with an interesting question: How many overall LeMons winners have also set the fastest lap going back to, say, the beginning of 2012? I found the answer quickly enough: Five out of 25 (Through Gingerman 2013). * The timing sheets actually show Hong Norrth as third-fastest at CMP with a 1:56.2, but the two faster entries are almost certainly timing errors: the Howard Turkstra Motorsports Toyota Celica clocked a literally impossible 1:03.0 and the Team Turbo Schnitzel Merkur XR4Ti has a 1:50.7 on its timing sheet, which would be plausible if any of their other lap times had been faster than 2:10. With just four exceptions (some of which we'll look at a little more closely later on), the overall winners have been in the 10 fastest cars, as determined by fastest lap. The race winner's fastest lap, on average, ranks 5.83 among the fastest laps in the whole field. So what does that mean? To win a race, you don't have to be THE fastest car driven by the fastest drivers. However, you tend to need some fast drivers in a pretty fast car. Makes sense, right? There's an interesting mix of finishing positions to be found, with almost equal parts Top 10 times and poor showings. The average finishing position of a fastest team calculates out to 22.2, although a two outliers in 95th and 109th places inflate that number. For a little perspective, the median on that list is 10th place. So what does that mean? It reinforces the idea that the fastest teams tend to do well, but it's not an absolute. Look at Walk of Shame's results: three fastest laps, two of which are Top 10 results and one of which is a 63rd place. We don't know the whole story of that 63rd place, but at first blush, it looks like several of the fastest teams either get themselves into black flag trouble or use up their car mechanically. - Bucksnort Racing has raced in four LeMons races since 2012 started and have set fastest lap in all of them. 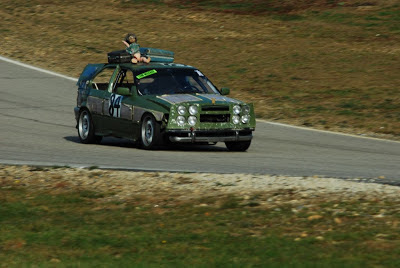 They also would have tied Clueless Racing for a fifth fastest lap at Gingerman in 2011, except the super-cheaty Pratt and Miller-built Camaro blew both of them away by three seconds. - Walk of Shame, as we pointed out, racked up three fastest laps from our data set, but they went out and tacked on their fourth at the last race in New Hampshire, which is not included in our data. 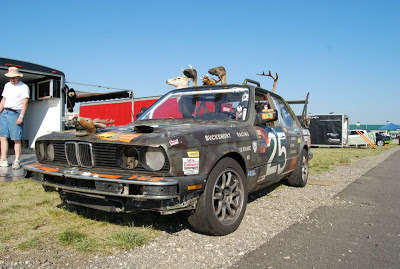 - LeMons legends Eyesore Racing earned two fastest laps a year apart at Sears Point. That looks awfully close to the average finishing position for the fastest car at each race. Maybe there's something to that number. If the fastest 10 cars in a given race average a finish in about 25th place, that tells you that plenty of them end up blowed up or sidelined with penalties. Then again, a goodly amount can extract a good finishing position from speed. Unlike the average we found just above, this differs greatly from the fastest-lap rank of overall winners, meaning there's a substantial gap between any old Top 10 car and the winner. This won't surprise too many people; usually one or two teams are the class of the field at a given race and the Top 10 is filled with substantial gaps in lap count. The fact that this number is lower than the average finish of the 10 fastest indicates that other factors may be more important than overall pace in an endurance race. For many, this is another unshocking non-revelation. "Wait!" You're almost certainly not saying. "That can't be all. Small sample size, you jackass!" "Well," we say, "have we got a surprise for you?" "I guess that would be fine," you say. "I might even read that. Seriously, though, you can stop the hypothetical conversation." So there's a Part 2 and it will have a lot more data and much less vaguery (or maybe more). Mostly, this part was to show how the thought process evolved, to give some anecdotal bits, to answer Murilee Martin's question and--most importantly--to put to rest all of those bizarre compulsions I have to look at statistics that probably just indicate common sense. Look for a longer, interesting-er and graph-happier Part 2 tomorrow. Personally I'm interested in the other end. How many cars does the car with the slowest lap end up beating. That's a good addendum to add. Maybe I'll just make this a rolling series that I'll add to.